Please can you give me answers to this sales objection: Your product costs too much money compared to other similar products that I've been offered. This is a sales objection that I often come across and it will greatly help me to increase sales. A great question that all sales people face at sometime. Here's 5 effective objection tips to handle sales objections about price. 1. Make sure the buyer is comparing other products that offer what yours do. Are they of the same quality? Do they have the same features that yours has? Do the cheap competition have the same benefits for the buyer? You can overcome objections to price by showing why your product is better value and saves money in different ways. 2.Will your product work out cheaper in the long run? For example will yours last longer. Can you offer a better service package and guarantee. Perhaps the running cost of your product is more economical. To handle sales objections on price consider if there are other cost savings such as less man hours needed or lower maintenance cost. You can ofetn answer sales objections by looking at how you bundle your products together. Sometimes you can offer a flexible package that gives the customer exactly what they want with no waste. This means that while part of your bundle of products is more expensive than the competitors they are only buying what they need. A really effective sales objection technique is to breakdown the cost of the product. This works really well when selling a service. You show the customer what the product costs you to manufacture, buy in, package, deliver, and any other part of the supply process. Then you openly show what profit you are making. Explain that if a competitor is supplying the same product cheaper they would have to cut the cost, and probably the quality, of part of this process. Therefore they may get a cheaper 4f454bdb4cb09e46c9629b58430510ebproduct or service but they may also get inferior service. Look for how this may impact on the customer, such as deliveries or breakdown help when required. Show the service and overall package that you offer with all it's benefits. Depending on what you are selling the buyer's decision will be made with a combination of logic and emaotion. Where the decison to buy is made with emotion and impulse you can influence your customer to buy now rather than sit back and consider all the alternatives. Clothing retailers do this all the time. When you buy clothes do you tour all the different shops looking for the cheapes? Or, do you see what you like and feel good about making the purchase, and then convince yourself with logic that you are making the right decision? This technique often prevents sales objections to price. 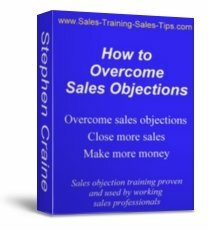 Use the 5 sales objection techniques for sales objections based on price and you will have a quick way to increase sales and make more money. You can increase your sales even more with a quick and easy sales training course on handling sales objections.